When installed on a flat surface, Side Emitting LED Strips shoot light horizontally. Side Emitting LED Strips are perfect for installation on curved surfaces where you require the light to be directed up or down. Side emitting LED Strips are also referred to as horizontal or side view LED Strips. This single color Side Emitting COOL WHITE LED strip is easy to install, very bright and uses low voltage (12V, 3A). The side emitting LED strip is very thin and flexible, measuring only 5mm wide and 2mm thick, it's the brightest and most compact LED Strip of its class. This 5 meter long LED Strip includes 300 LEDs which are encased in a self adhesive flexible silicon band. This kit includes a dimmer and a wireless remote, you can dim the light to get exactly the luminous intensity required for your project. 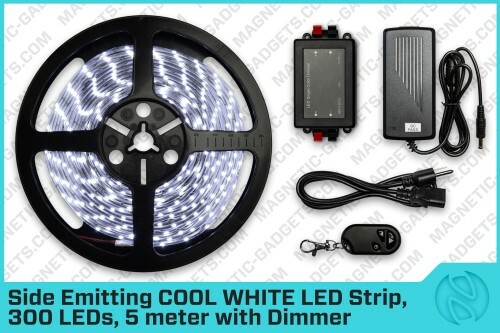 The 3514 COOL WHITE LED Strip is completely flexible and waterproof. LED strips offer creative options for upgrading the lighting of any room. Our LED strips can be used to set the mood in bedrooms, living rooms, conference rooms and office reception area. It’s also the coolest way to decorate any vehicle, bar and display counter. LED Strips are great for creating the perfect lighting for everyday living to party lighting.